Barbecued pork tenderloin with stir fried veggies drizzled with a spicy terikayi sauce served over quick and easy coconut rice. There’s a popular fast food restaurant in Utah, Rumbi Island Grill, that sells rice bowls with your choice of meat, sauce and rice. 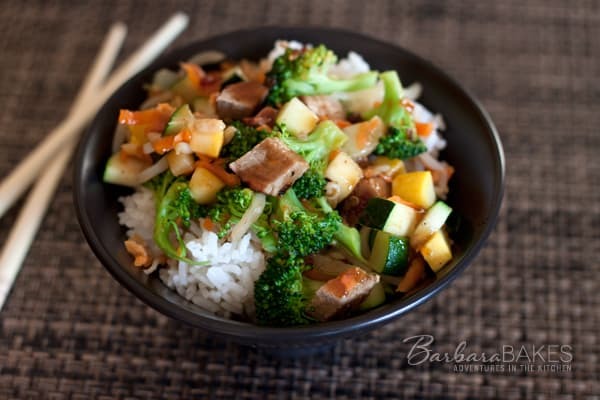 On Pressure Cooking Today, I recently posted a quick coconut rice recipe served with Favorite Family Recipes’ popular copycat recipe for Rumbi Rice Bowls with Spicy Hawaiian Teriyaki Sauce. My family enjoyed it so much that a week later, I decided to create a pork version with leftover barbecued pork tenderloin and my garden veggies that needed to be used. The pork version was just a delicious as the chicken version, so feel free to use whatever meat and veggies you’ve got hanging around. I also changed up the sauce a little bit. I wanted it a little bit thicker and cooked it in the microwave instead of on the stove top. I cooked it in my glass measuring cup with a spout, so I could just served it in the cup. Be sure and cut the veggies in to similar size pieces so that they all cook at the same time. This is a quick and easy summer time meal that won’t heat up your house. Combine teriyaki sauce, soy sauce, chili sauce, ginger, salt, and brown sugar in a microwave safe bowl. Microwave on high until mixture comes to a boil. In a small dish, combine cornstarch and water and add to sauce. Microwave on high, stirring occasionally, until sauce thickens. Heat vegetable oil in a large skillet or wok over medium-high heat. Add carrots, squash, zucchini, broccoli, and bean sprouts. Saute vegetables for 1-2 minutes until they are tender but still crisp. Stir in cubed pork tenderloin. Serve over coconut rice drizzled with the prepared teriyaki sauce. Made this today but used barbecued soy curls in plaaaaace of the pork since it was Meatless Monday. Delicious! We’d love this for dinner — the guys would lap it up. Our Chinese take out place doesn’t have rice bowls so it’s time I made them myself! Complimenti Barabra un’altra tua ricetta bellissima!!!! Mmm!! Love Rumbi! I can make this on Sunday when they’re not open. Perfect! All of those flavors look sublime! Love teriyaki sauce. 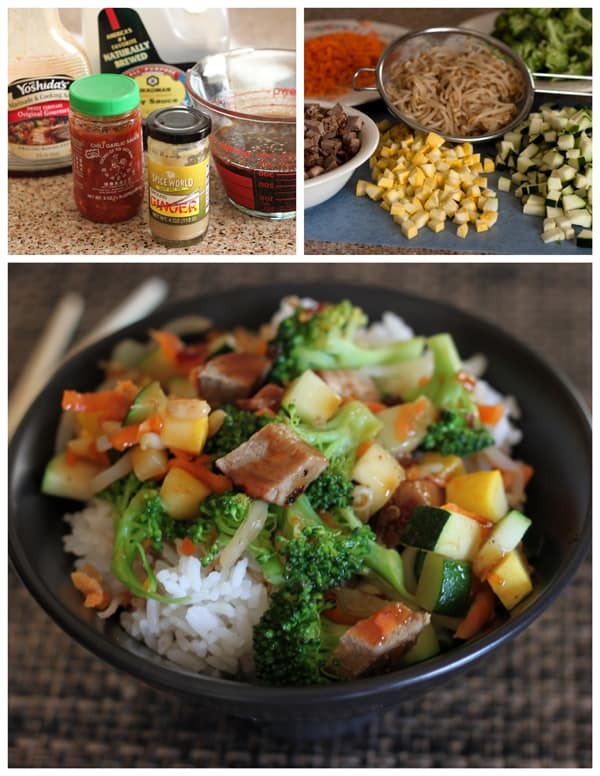 The stir-fry looks scrumptious! What a gorgeous shot and flavor combo. Looks super easy for weeknight too. I haven’t been to Rumbi but no need to go- I can just come to your house instead! These look great Barbara. Definitely my kind of food!! Scrumptious and healthy! I cannot resist such dishes. I haven’t seen Yoshida’s sauce in years. Thankfully I found a clone recipe that works nearly as well – just a bit more work. I love your pork teriyaki!